The Church viewed from Bidwell Lane. The Ecclesiastical Parish was joined with that of Higham Ferrers until 1927, when it was joined with Newton Bromswold Parish. This continued until 1967, when it was split again and rejoined with Higham Ferrers Parish. The Church largely dates back to 13th century (1220 - 1250), with additions in the 14th & 15th centuries (the porch has a datestone of 1685). The octagonal stone font is 13th century, whilst the oak pulpit is in memory of Jane Harriet Wise (1829 - 1908). Restored and extended in 1849 at an estimated cost of £726, the Church is now a grade II* listed building. The church is set back from the Caldecott Road and sits with the churchyard, which is still open for burials and internment of ashes. The Friends of St John the Baptist Church supports the maintenance of the fabric of the church and churchyard. The organ was installed by Percy George Phipps (1872 - 1953) of Oxford in 1909. The Phipps organ company was founded in 1907, so this could be one of his early commissions. The business was continued by his sons until 1962. An article on the organs and the restoration of the present organ in St John the Baptists Church, by Tina and David Hackett of Chelveston. In the last century, electricity arrived during 1951-2, the Lady Chapel was restored in 1967 and a water supply was laid in to provide a servery area for functions in 2004. A toilet was also installed at that time. A sound system was introduced in 2014. 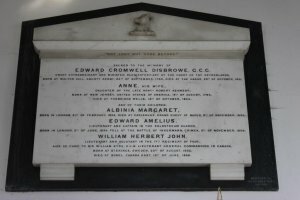 Plaques on the wall of the chancel include a Lord of the Manor Sir Edward Cromwell Disbrowe (1790-1851), his land agent Andrew Leighton (1794-1868), and James Moyes Gray (1837 - 1901), land agent to Mrs Wise. The 60ft high tower on the north side of the church contains 5 bells which are no longer functional. The clock was installed in 1867 for £86. At the base of the tower is a memorial to the 305th Bombardment Group that flew out of RAF Chelveston from 1942-45. In May 2012 an electronic carillon bell sound system was installed, which can be heard using the YouTube link below. List of the known incumbents of St John the Baptist Church. The Vicar is Revd Canon Richard Stainer. The Churchwardens are Arthur Wright and Peggy Deards. A sung communion service is held at 9:00 on Sundays.